than popsicles and Gumdrop socks? In my little book of rules regarding tolerable weather...anything over 70F is hot. So you can only imagine my feelings about days over 90F! Say it with me, "Oy!" Ahhh, yes...the RSC July Gumdrop socks are on the needles in all their wonderful glory. I love the yarn. I love the pattern. These socks are clearly vying for my number one favorite socks of the year!! I heart them all over the place! I think Mr. NK and I better go finish up these popsicles before nothing is left but a puddle!! I LOVE your pictures. Now 'fess up. Did you go out and buy those particular popsicles just for the photo shoot? That's a dedicated blogger! You are a brilliant photographer! Great Drip! Yes, any tips for using magic loop with the monkey socks? I really like the way you are able to marry the colours of nature and yarn. You have an incredible eye for composition! 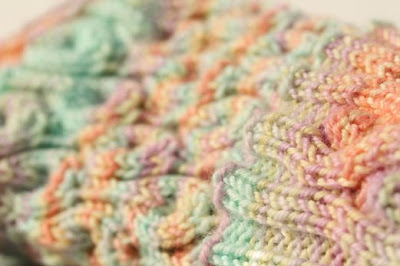 By the way, how did you get the large background photo of the yarn on your blog? I've not been able to find out how to do it. Can you direct me? As always WoW! Your pictures are stunning. Makes me want to grab my StR yarn and knit this one up right now. Love the popsicles! Maybe I can work this sock club kit up on vacation, it is a cooling colorway at least. I agree with you about the heat!